Mohammad Mahmudullah Riyad born on 4 February 1986, regularly known as Mahmudullah, is a Bangladeshi cricketer. He has played First-class and List A cricket for Dhaka Division and has represented to Bangladesh in all types of the game. An all-rounder, he is a lower or middle-order batsman and in addition an off-spin bowler. He is the first Bangladeshi to score a World Cup hundred. In the 2008/09 Bangladesh domestic season, Mahmudullah completed as the second-most astounding run-scorer in the opposition with 710 runs at an average of 54.61 and was along these lines reviewed to the ODI squad to confront Zimbabwe in three ODIs and a tri-series with Sri Lanka and Zimbabwe. Mahmudullah Riyad is the most generously compensated cricketer in Dhaka Premier Division Cricket League 2017– 18, Mahmudullah was the first choice in the player by draft for the Dhaka Premier League. He was obtained by Sheikh Jamal Dhanmondi Club. Mahmudullah influenced his Test debut on 9 July 2009 against the West Indies. He performed inadequately with the bat, however got the best test playing figures in a match by a Bangladeshi on debut, with an eight-wicket pull, including a five wicket pull in the second innings. Mahmudullah was called up for Bangladesh's ODI squad for the 3 matches against Sri Lanka in Bangladesh's voyage through the nation in July 2007. He made his presentation on the visit, in the third ODI, where he was Bangladesh's second most elevated scorer with 36 runs and furthermore took 2 wickets, in a match Sri Lanka won by 39 runs. On 9 March 2015, in the 2015 ICC Cricket World Cup, against England, he scored the first century by a Bangladeshi batsman in World Cup history. Bangladesh went ahead to win the match and reached to the quarter finals. In the following match, on 13 March, he scored another World Cup century, this time against New Zealand, albeit New Zealand won by 3 wickets. In six matches in the World Cup he scored 365 runs at as average of 73.00. Although Mahmudullah scored a Test century batting at number 8 against New Zealand, the selection committee preferred not to promote him up the order due to a perceived weakness against fast bowling, despite the number four spot having no permanent occupant. The Bangladesh Cricket Board established the six-group Bangladesh Premier League in 2012, a twenty20 competition to be held in February that year. 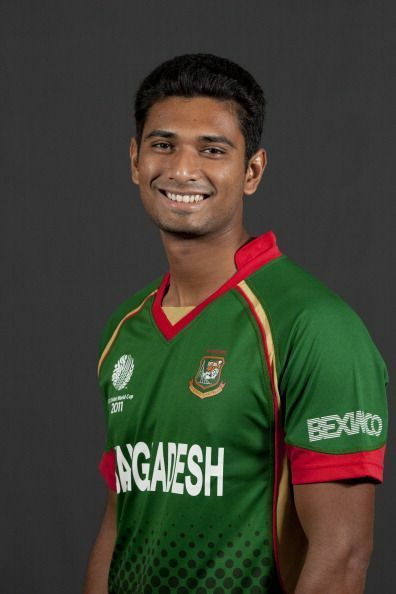 A auction was held for teams to purchase players, and Mahmudullah was purchased by the Chittagong Kings for $110,000. For the 2017 Pakistan Super League, Mahmudullah shrunk by Quetta Gladiators. Mahmudullah was named Bangladesh's vice-captain, assuming control from Tamim Iqbal after the previous captain and deputy were sacked. When West Indies visited in October, Mahmudullah missed every one of the fixtures with a viral fever. He recouped so as to rejoin the squad to confront Pakistan in three ODIs in November. Mahmudullah scored 56 runs and knocked down some bowls in only one match, taking three wickets from seven deliveries. Should there be whipping boys in global sports?